If you drive a coupe, sedan, minivan or crossover vehicle (CUV) and you need a reliable snow tires, consider the Bridgestone Blizzak WS70. This snow and ice tire was designed as the fourth generation to Bridgestone’s WinterBiter tires. Delivering confidence through superior design, the Blizzak WS70 offers safe handling regardless of the weather forecast. This tire optimizes snow and ice performance through Bridgestone’s NanoPro Tech with RC Polymer. Fancy words, but what it does is fancier. 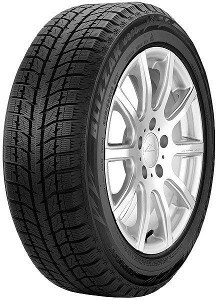 This tire has a dual compound tread structure, where at the molecular level, interactions of polymer, filler and rubber chemicals are controlled. This new Multi-cell Compound allows the tire to push away water trapped between the ground and the tire’s contact area. As the tire wears, new molecular tubes are exposed to keep the tire performing well in winter conditions. This tire also features a new 3-D Sipe design which allows the tire to maintain stiffness around contact areas and disperse water, snow and ice away from the tires. The tread design in this snow tire allows for optimal performance on dry roads. Armed with a tread depth indicator, this tire tells you when it is 50% worn and within 10% of the remaining Multi-Cell Compound Tread. Start shopping the Bridgestone family of snow tires and compare with other options, we carry the largest online selection of winter and all season tires, all the brands at the best prices.